My perceptions of Christmas market food changed forever when I learned about the wonders of the Yorkshire Pudding Wrap. The adaptability of the humble yet glorious Yorkshire Pudding has been sorely underestimated over the years. Many of us have of course long enjoyed mopping up scraps of gravy and stuffing with our mum’s Yorkshires. However, little could we have guessed how the Sunday roast favourite would one day rise far above the tortilla or the sub when it comes to holding a generous helping of sandwich filling. 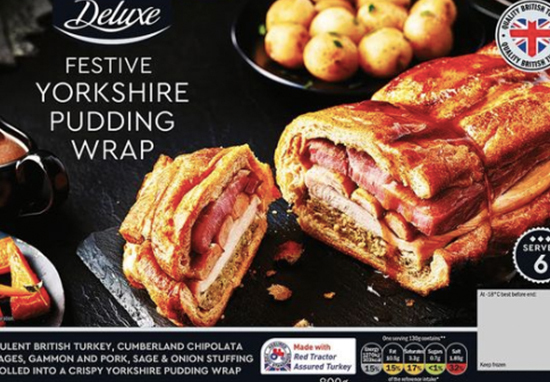 Now Lidl have got in on the act, with a golden Yorkshire Pudding Wrap which can serve a family of four plus two guests. This 800g whopper is packed with British turkey, Cumberland chipolata sausages, gammon plus pork and sage and onion stuffing, the Deluxe Festive Yorkshire Pudding Wrap is ideal for a cosy, festive meal at home. Costing £7.99, this comfortingly Christmassy dish is also served with a jug of gravy, which of course maketh the Yorkshire. At £1.30 per serving, this is substantially cheaper than the ones you will find in wooden pop up huts on your high street. And you can chomp it down from the comfort of your own sofa. And – good news for those of us half-heartedly trudging off to Slimming World classes on these cold winter evenings – each portion contains 303 calories which isn’t too bad when you consider the chocolatey, brandy soaked diet which is December. It seems this year it is all about huge versions of festive faves, and I for one am all for it. Asda are currently selling foot long pigs in blankets – ie the best part of the Christmas day feast – made up of 500g of pork and wrapped in 100g of dry cured streaky bacon rashers. Everybody’s favourite Christmas dinner essential is bigger and meatier than ever. And what’s more, our Christmas gift to the nation has come early – eager customers won’t have to wait until Christmas to shop the sausage in-store, but can get their hands on the Extra Special Pig in Blanket from next month, launching 22nd October. Yorkshire pudding wrap. What a great idea. Anyone else starting to feel seriously festive right about now?